President Muhammadu Buhari got a unique gift of a goat during his just-concluded two-day official visit to Edo State. 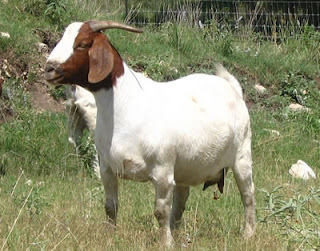 The goat was said to have been presented to Buhari by an elderly lady, Egbon Grace, who is a member of the All Progressives Congress in Ward 7, Oredo Local Government Area of Edo State. The official said opportunity came for the lady on Monday when Buhari inaugurated the ultra-modern Samuel Ogbemudia College in Benin City. “Lady Grace braced the odds and came all the way with her surprise gift to Mr. President which she had kept in waiting for the special occasion. “She tore through the thick crowd, making her way straight to the President who at the time had finished the official engagement and was heading for his waiting car. “Many in the crowd got emotional seeing the elderly lady pull through the crowd with the goat, determined to make a presentation to the President,” the source said. The source added that Governor Adams Oshiomhole who noticed the security cordon between the lady and the President, alighted from the President’s convoy to receive the goat on behalf of the President. He said Grace later had an opportunity to interact briefly with Buhari and the Governor. She was said to have thanked the President for accepting the gift which was handed over to protocol officials. In his remarks on behalf of the President, Oshiomhole commended Grace for her kind gesture.